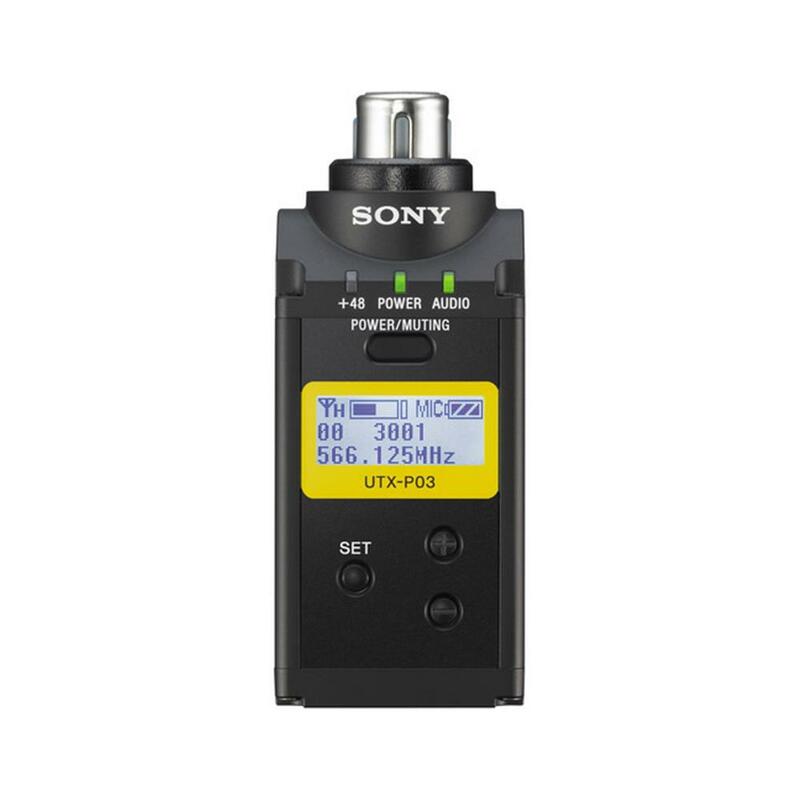 Henrys.com : SONY UTXP03K14 WIRELESS PLUG-ON TRANSM. SONY UTXP03K14 WIRELESS PLUG-ON TRANSM. The UTX-P03 plug-on transmitter is designed to be used with Sony UWP-D series wireless tuners. It's extremely durable and is well balanced for use with the Sony F-112 - a dynamic microphone suited to cost-effective newsgathering applications. The UTX-P03 plug-on transmitter also accepts line-level audio input signal as well. Whether used in a low-cost ENG or EFP system, the UTX-P03 delivers the convenience of wireless microphone operation including phantom powering at a very affordable price. The UWP-D Series wireless microphone systems uses Sony Digital Audio Processing to improve sound quality and transient response performance compared to conventional analogue wireless systems. It provides superb transient response performance. Analogue companding systems cannot accurately reproduce sounds such as a bell, tee shot or hand clap, but Sony Digital Audio Processing reproduces them faithfully. Converts a wired microphone to a wireless microphone via an XLR connector. The plug-on transmitter expands the flexibility of the UWP-D system. The UTX-P03 XLR plug-on transmitter features a bright 11.5mm x 27.8mm display, significantly larger than previous UWP models to make them easily readable in all situations. The UTX-P03 XLR plug-on transmitter has a micro USB terminal for connection to USB external portable power sources allowing the unit to be powered by the camcorder during use, resulting in hassle free power. You can also load NiMh batteries into the transmitter to be charged through the micro USB. The UTX-P03 XLR plug-on transmitter is made of strong, durable metal. Metal construction supports reliable use in rough operating conditions. The system provides variable output level control of +-12dB, for use with the various input levels of camcorders and DSLR cameras. Dimensions (WxHxD): 42 x 42 x 102 mm / 1 5/8 x 1 5/8 x 4 in.